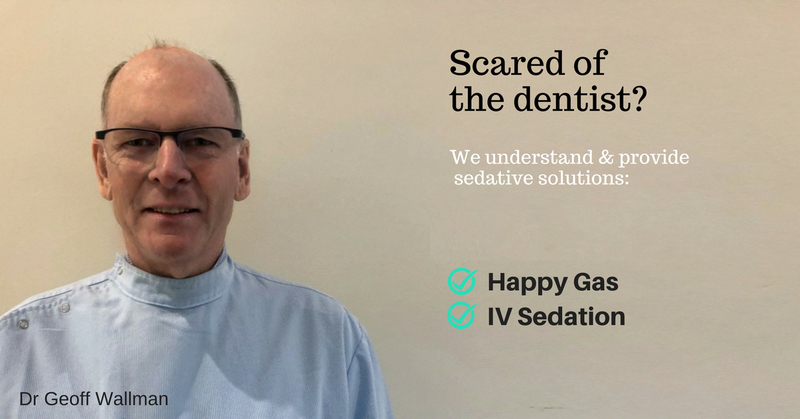 We understand how real your fears are and we can help with dental anxiety and dental phobia. Welcome to worry free and fearless dentistry at Blackwood Dental. We offer comfortable options to ease your dental fears. Our experienced dentist, Dr Geoff Wallman, and compassionate staff work together with you to ensure your dental experience is as pain-free as possible. Nitrous oxide is very popular as it only takes around 5 minutes from inhaling for it to take effect and because of how quickly a patient recovers from it. Typically the patient will remember very little of the procedure and can sometimes fall asleep. IV Sedation is a moderate type of sedation. Patients who have previously experienced IV sedation often report feeling like they slept through the entire procedure. Generally, IV sedation is used for shorter treatments. It is administered via direct injection into the bloodstream, which means the effects are immediate. Sometimes patients feel groggy and sleepy when the IV sedatives are withdrawn. This is why it is important to bring a designated driver for the drive home.